It has a big sound, and Roland's TR-909 drum machine has certainly left a large sonic footprint on the history of electronic music, so it's perhaps appropriate that Edinburgh-based arts collective Ray is celebrating 30 years of the instrument by creating an oversized 9-foot replica. Six times the size of the original, this playable sculpture, designed by project leader Brendan McCarthy, has a tensile steel and aluminium frame supporting a wooden outer shell. It can be assembled and taken apart in minutes, but is said to be tough enough to take a beating. The guts of the machine, which were assembled by Sam Healy (of psych-rock groups North Atlantic Oscillation and Sand), recreate part of the original 909's interface using off-the-shelf Roland gear. 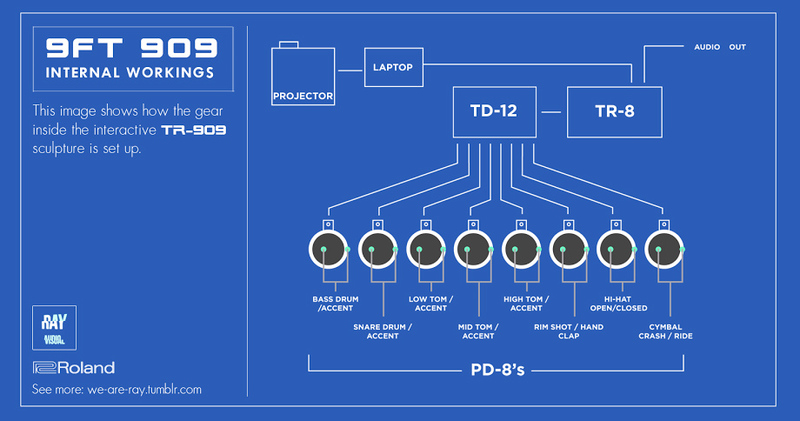 There are a dozen PD-8 drum trigger pads fitted under the spring-loaded buttons, which feed into a TD-12 drum brain. This in turn sends MIDI data to an Aira TR-8. When interacted with, the sculpture not only pounds out 909 sounds via the TR-8, but also relays the MIDI data to a projection system synchronised to the beat. The more complex the rhythm, the more intricate the visuals. The result, according to Ray is: "A hands-on behemoth wired for sound and vision. An interactive monument to electronic music." The 9-foot 909 is appearing at this weekend's Green Man festival, and will also be at Bestival on 4 to 7 September. You can see it in action in the video above, and find out more on the Ray Tumblr.